I’m thrilled to be facilitating an ongoing group at Circles of Wisdom in Andover Ma for budding or active heart-centered entrepreneurs, which will focus on business building and networking. The Spiritual Business Abundance & Networking Group will meet the first Wednesday of June and July and beyond if there is demand. Arrive early, if you can, for optional networking time from 6:30-7:00 pm. The actual program will begin at 7:00 pm and run until 9:00 pm. 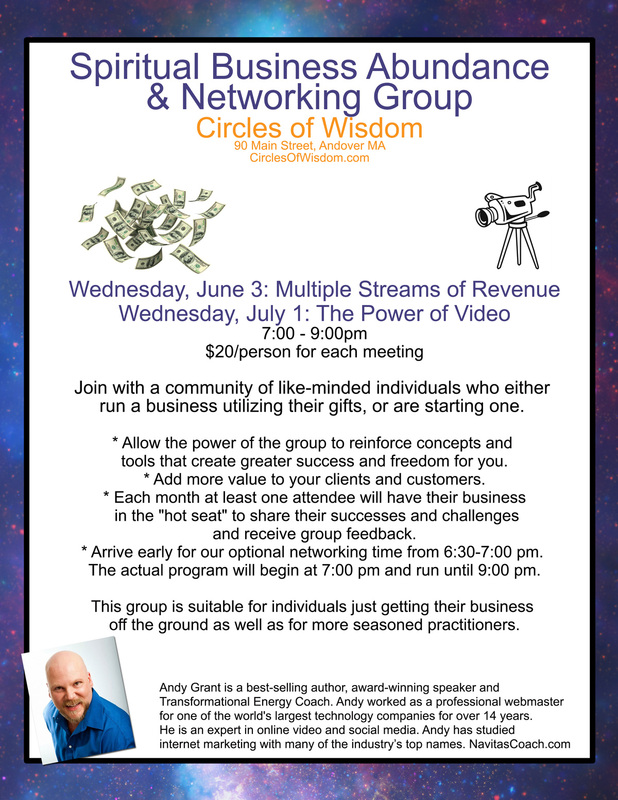 June 3 Topic: Multiple Streams of Revenue. The key to any successful business is having multiple streams of income, ideally multiple streams of passive income. Too many entrepreneurs fall into the trap of trading their time for money. July 1 Topic: The Power of Video. Video is one of the most powerful ways you have to connect with your prospects, clients and partners. Are you using video in growing your business? Are you using video at all? Join with a community of like-minded individuals who either run a business utilizing their gifts, or are starting one. Sit in the vibration of abundance together. Join with peers in a joyous, and at times, poignant look at what we are all doing with our own businesses. Allow the power of the group to reinforce concepts and tools that create greater success and freedom for yourself, and add more value to your clients and customers. Each month at least one attendee will have their business in the “hot seat” to share their successes and challenges and receive group feedback. Bring your business questions to this monthly gathering and be open to new insights. The more you share, the more you will receive. In these monthly meetings we will review basic tools, concepts, and strategies to equip you to deal with some common business challenges, obstacles, and frustrations. Discussion will ensue on how to deal with practical and strategic issues more effectively, transforming your business and your life. Networking is a valuable component of this group and a powerful business builder. You will have the opportunity to support and empower one another by sharing experiences and collaborating. There will be 30 minutes (6:30 – 7:00) prior to group each month set aside for networking. If you have marketing material of your own to share it is advised that you bring at least 20 copies of your business materials to each class to distribute and arrive in the networking time to connect with others. Each participant will leave with contact information from other group members (who choose to participate). Be sure and bring plenty of business cards. The Spiritual Business Abundance & Networking Group will be held on the first Wednesday of each month beginning in June, 2015. This class is suitable for individuals just getting their business off the ground as well as for more seasoned practitioners. Arrive early for optional networking time from 6:30-7:00 pm. The actual program will begin at 7:00 pm and run until 9:00 pm. Leave a comment for: "Spiritual Business Abundance & Networking Group Kicks Off June 3, 2015"